DEEP SOUTH PERSONAL CARE HOME is having a CLARA CLARK SHEETS FUNDRAISER! All SHEETS are 1800 TC MICROFIBRE! There are 12 colours to choose from and all sheets (twin, double, queen and king) are $50 per set, with $10 going right back to our organization! If anyone is wanting to order a set, please call Carrie at (306) 442-2043. The Deep South Personal Care Home is having a clean up and painting party!! Bring your work clothes, paint brushes and garden equipment, we’ll provide the cleaning supplies. Tuesday, June 20th 10:00 am to 7:00 pm. BBQ hot dogs/hamburgers ? salads, ice cream treats and lemonade will be provided all day! PS. We will need a trailer to haul refuse away too please. The Deep South Personal Care Home located in Pangman, SK is currently accepting applications for residency. Our facility has 24 spacious rooms with private 2 pc bath, delicious and nutritious home cooked meals, daily activities and very caring staff. Competitive rates and, you may qualify for up to $1,800 through govt assistance. Please call Carrie at (306) 442-2043 for more info. The Deep South Personal Care Home Residents Christmas Supper was held on Sunday Dec 6th at the Care Home and hosted by the Board. 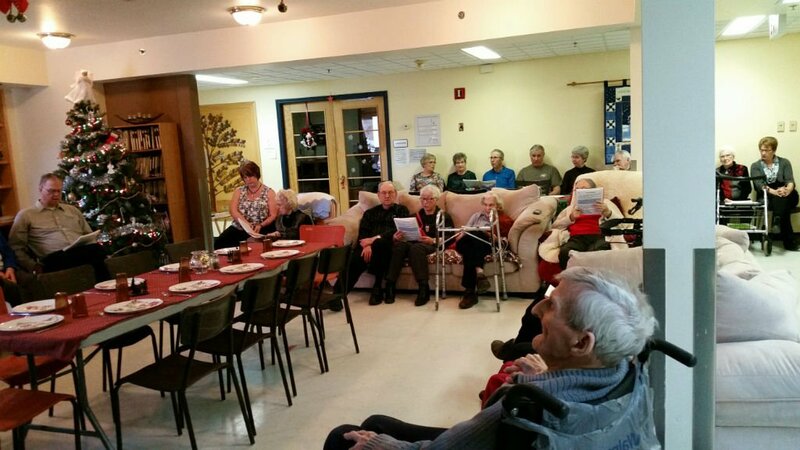 The residents were invited to a sing song prior to eating. John Sheppard played piano and Gerry Tondevold lead the singing. The residents and their guests sat down to a turkey/ham meal with home made pie for dessert. There were about 70 folks served and the meal was enjoyed by everyone. Effie Devine, on behalf of the resident, thanked the board for the meal and Ernie Schenher,-on behalf of the guests, also thanked the board for the Christmas meal. The day was very lovely for anyone who had to travel. It is always nice to have something special for the residents of the Care Home. On Friday, May 15, 2015 there was a Bridal Show followed by the Mother’s Day Tea held at the Deep South Personal Care Home. At the Bridal Show models wore dresses from the 1920’s covering each decade up to 2000. Some of them were graciously loaned to us by Lorraine Iversen and the Ogema Museum. Ruth Taylor was our M.C for the event. The resident’s and guests enjoyed the show which was followed by an after noon tea and cake walk, sponsored by the Deep South Ladies Auxilliary. Thank you to Heather Reaney for the photos and thank you to Sharna Bishop our hair dresser for doing several of our bride models hair. Front Row Gail Stanton and our flower girl is Alyscia Ferozdin. This article was submitted by Gail Stanton. Joel Decque from Paris, France arrived in Pangman Sunday afternoon, on a 14 speed bike, having travelled in the wind from Weyburn. He was needing to tent for the night and the cafe wasn’t open. So we made arrangements for him to eat at the Care Home and both the residents and himself had a great time. He is travelling to Vancouver to meet up with his family the end of August and flying back to Paris on Sept 3rd. 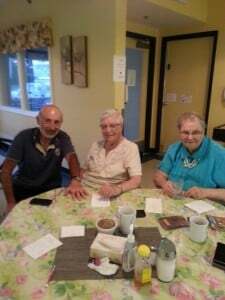 His stop in Pangman offered the residents an opportunity to have a visit with someone from another country, which was enjoyable for everyone. He exchanged e-mails & blog addresses and was very happy for the evening. He will be on his way in the morning after coffee at the Community Centre. Small town hospitality at its finest. Always glad to get in on these visits. Special Tour Train Ride for Deep South Personal Care Home Residents! On Monday, May 19, 2014 the residents from the Deep South Personal Care Home were given a ride on the Southern Prairie Train. The residents had a family member or friend accompany them and some of the staff went along as well. The train came to Pangman to pick them up and took them to Ogema. In Ogema we were greeted by the Ogema Museum folks who gave us a ride on the people mover over to the Museum. There they had a very lovely lunch prepared for us. It was a bit rainy but it was a very enjoyable outing for everyone. There were sponsors who provided the ride and the train folks, Cheryl & Devon Generous, volunteered their time for that day. The train ride brings back an “era” that is long past so a time of memory for the residents. This article was submitted by Eileen Tunall. The Ladies Auxiliary would like to remind everyone that they accept donations of Canadian Tire Money. If you would like to donate your Canadian Tire Money you can leave it at the Hometown Cafe or give it to any Ladies Auxiliary Member. The Canadian Tire Money received is used to purchase items for the Deep South Personal Care Home. The Deep South Personal Care Home Annual Meeting was held on Thursday, March 22, 2012 at the Pangman Community Centre. Registration was at 7pm and the meeting followed at 7:30 pm. Jerry Tondevold chaired the meeting. Two employees received 5 year awards of a name tag and flowers: Terri Waldner and Audrey Weber. Jerry Tondevold thanked the staff and Lisa, the administrator, for their hard work over the last year. He also thanks all those who made donations to the care home. Lisa Still, Administrator, thanked the community and volunteers from the RM, Village of Pangman, Ogema, and Ladies Auxiliary for their help over the past year. 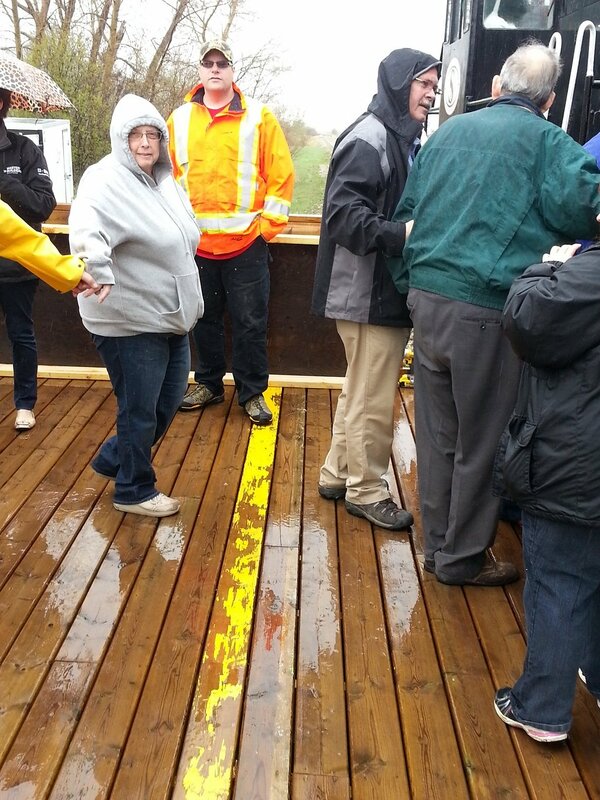 She also thanked the Board of Directors for helping with landscaping the backyard. Currently there are 24 beds full. The rent at the home increased 7% in January 2012. She thanked all the staff for their hard work.Currently there are 12 full time employees, 3 part time employees and 2 casual employees. Eileen Tunall presented a report on behalf of the Ladies Auxiliary. The Ladies Auxiliary raises funds to help with purchasing items for the care home. They purchased small gifts for the residents at Christmas. They also helped purchase 2 sofas for the living room and concrete for the patio and sidewalk. They will be hosting a Mother’s Day Tea in May, watch for more details. Coffee and donuts were served after the meeting. 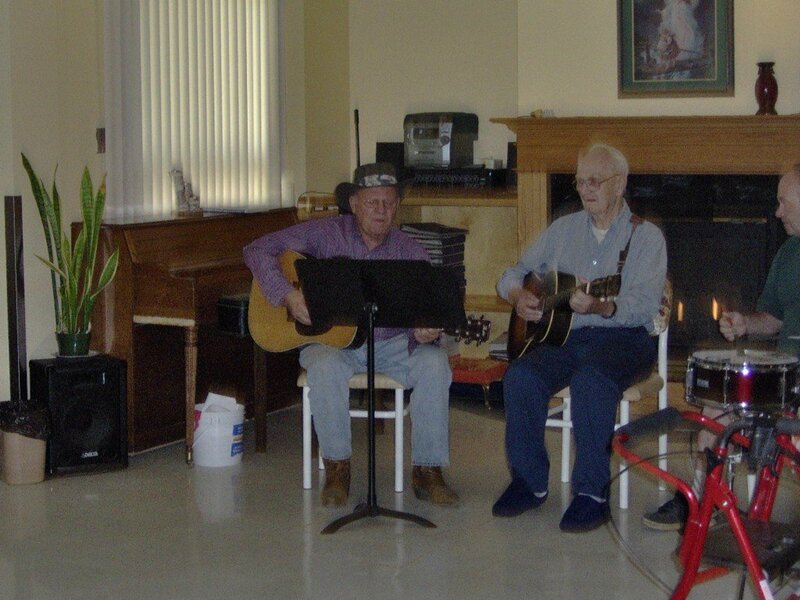 On Friday, September 2, 2011 three local musicians, Vern, Wayne and Phil played at the Care Home. 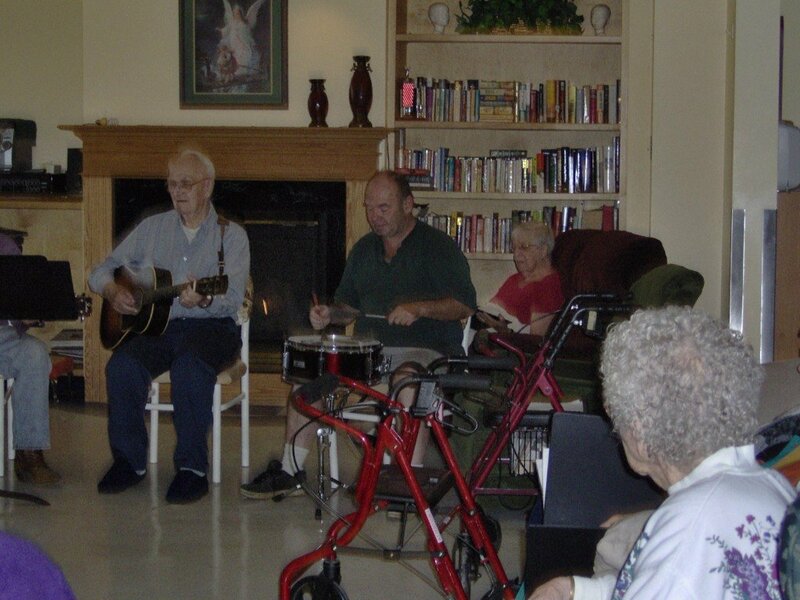 The residents of the home sang along with Vern as he played some of their favourite country tunes. Thanks guys for entertaining our seniors. 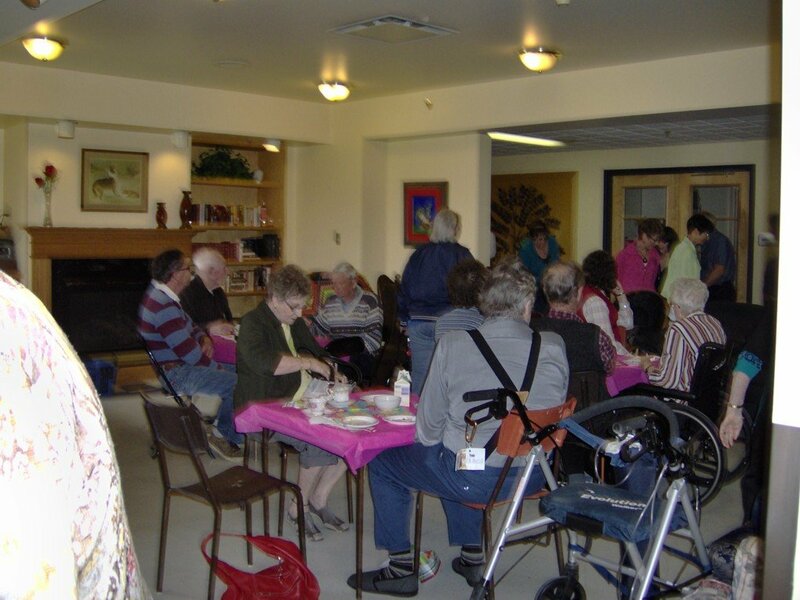 On Friday, May 6th, the Ladies Auxiliary hosted a Mother’s Day Tea at the care home. They served coffee, tea, angel food cake with strawberries and ice cream. About 75 people attended the tea. Quite a few people participated in the cake walk and the winners received home made cakes made by members of the Ladies Auxiliary. Ginny Allewell presented Clara White with a gift basket for her service as President over the past 8 years. Flowers were presented to four (4) previous members for many years of service on both the Hospital Ladies Auxiliary and the current Ladies Auxiliary, namely: Mary Scott, Kay Kessler, Violet Kessler and Ruth Prentice. 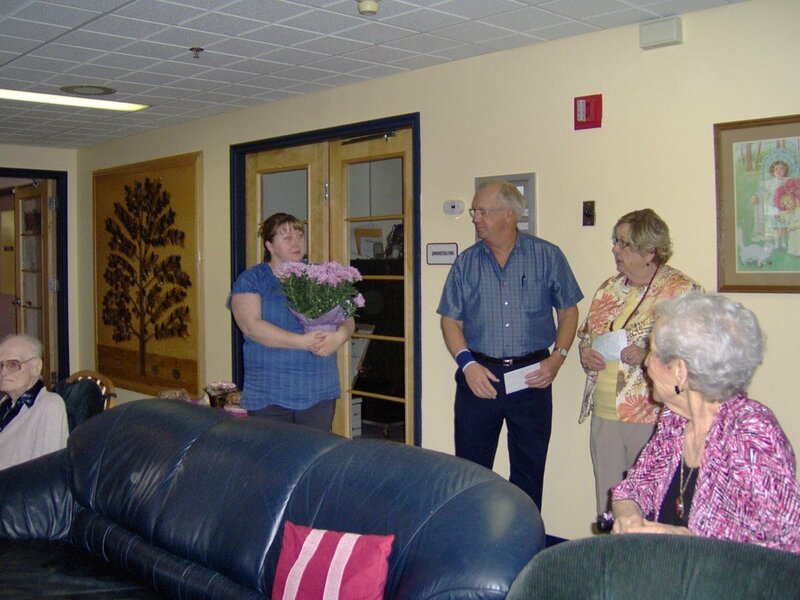 Lisa Still and Jerry Tondevold of the Deep South Personal Care Home board presented Clara White with a plant for her service as President of the Ladies Auxiliary. They would like to thank all those who came out to the Mother Day’s Tea and for their continued support of the care home. The Annual General Meeting of the Deep South Personal Care Home was held at the United Church on Thursday, March 31st, 2011. 16 people, including the Board and Lisa Still (Home Administrator) attended the meeting. The Chairperson for the meeting was Jerry Tondevold. The board thanked Lisa and the staff of the home for their dedication and hard work and also thanked the community for their continued support. Lisa Still reported on the heating upgrade with the engineering expertise of John Martin, countless hours from Roy Stirling and his crew at Ogema Welding & Machining along with many other devoted volunteers. Also the home purchased a new commercial washer, new beds, blinds for resident rooms and fenced in a secure courtyard in the backyard. There are currently 22 residents at the home. There are 10 full time staff, 2 part time staff and 4 casual staff. She thanked the Board, the Ladies Auxiliary and the community for all their support. A 10 year award of a nurses watch and red roses was given to Candice Sotropa. A 5 year award of a name tag and peach roses was given to Debbie Kessler. After the meeting coffee and donuts were served.